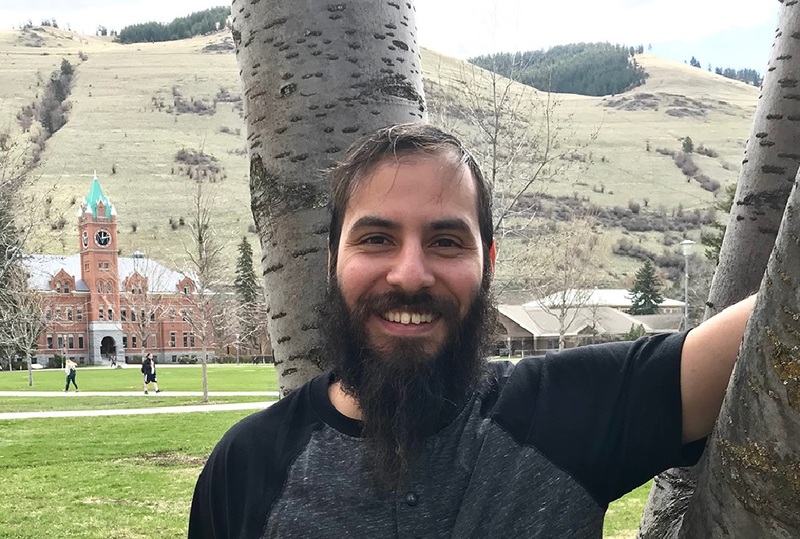 Missoula - Andrew Castellanos (B.A., Political Science, University of Montana, 2017) has been awarded a Boren Scholarship for the academic year 2018-19. Only four UM students have received this prestigious academic scholarship, three of being members of the UM Russian program including Castellanos. The Boren Scholarship, up to $20,000 funded by The National Security Education Program, is awarded to highly-motivated undergraduate students who wish to work in the federal national security arena. Boren Scholars commit to working in federal government for at least one year after graduation. Castellanos has a B.A. in Political Science with a minor in Wilderness Studies and is pursuing his B.A. in Russian with an anticipated graduation in spring 2019. Castellanos became interested in political science and studied Arabic language at Old Dominion University while on active duty in the U.S. Navy (2010-2014). After his honorable discharge, Castellanos enrolled at UM in fall 2015 due to UM’s strong Russian program and Wilderness Study program. He previously studied in Irkutsk, Russia during summer 2017, and will depart in August for the 2018-2019 school year to study Russian in Almaty, Kazakhstan, at Al-Farabi Kazakh University funded by the Boren Scholarship. Prior to his departure to Kazakhstan, Castellanos will travel to Washington, D.C., as an ambassador for the Boren scholarship where he will meet with Senators Jon Tester and Steve Daines, and Rep. Greg Gianforte. While in Almaty, Kazakhstan, Castellanos will be studying the Russian language, regional politics and economics, and the history of Kazakhstan; a former Soviet republic. Its location between the Siberian region of Russia to the north and the Xinjiang region of China to the south makes Kazakhstan an exciting place to study. “I get to study a landlocked country like Kazakhstan and see what they want. They are more western-oriented than Russia or China,” he said, wondering what the Kazakhs see for their future with climate change in their country. Besides studying Russian language, Castellanos said he will study economics and climate ecology in Kazakhstan. He said climate change is well underway to the north in Siberia. With the melting of the permafrost and polar arctic, new areas are being revealed, and this is of strategic important to the United States. Castellanos said many people at UM helped him to achieve the Boren Scholarship. He gives special thanks to Marja Unkuri-Chaudhry, the Interim Director of Global Engagement Office. Both Sara Rinfret and Eric Schluessel of the UM’s Political Science department were instrumental in aiding him, as well as Brock Tessman, Dean of Davidson Honors College. Lastly, Castellanos thanks Laure Pengelly Drake of the UM Writing Center, and Professors Ona Renner, Alice Harris and Clint Walker, in the UM Russian language department. Click here to receive the Global Engagement Office quarterly newsletter.